I-LABS Outreach has recently made available a new website and a set of online training modules that explore the latest science of child development. The modules are designed to be useful for both everyday interactions with children and for informing systems-level programs and policies. There are now 10 modules available on topics that include brain development, language development, attachment and sharing attention. Five of the modules are available in Spanish, and Vietnamese and Somali versions will be added soon. Modules include visual and auditory content that is reinforced with video clips, as well as supplemental resources like discussion guides to facilitate use of the modules in group settings. You can access the new website at http://modules.ilabs.uw.edu/outreach-modules/. All users, even those registered on the previous system, will need to create a new account. What’s The Relationship Between Infant/Toddler Development and School Readiness? 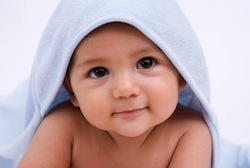 Baby Talk is a free, one-way listserv that is distributed each month. Each issue features one or more resources, the majority of which are available to download at no cost. To join the listserv, send an email with no message to subscribe-babytalk@listserv.unc.edu. To suggest resources, please contact Camille Catlett at camille.catlett@unc.edu or (919) 966-6635.